Peter Philadelphia was born from one of the seven bloodlines of The Veil, which means he is specially equipped to hunt mysterious lost souls known as ghost orphans. He carries a weapon called a living-blade that is infused with his blood. 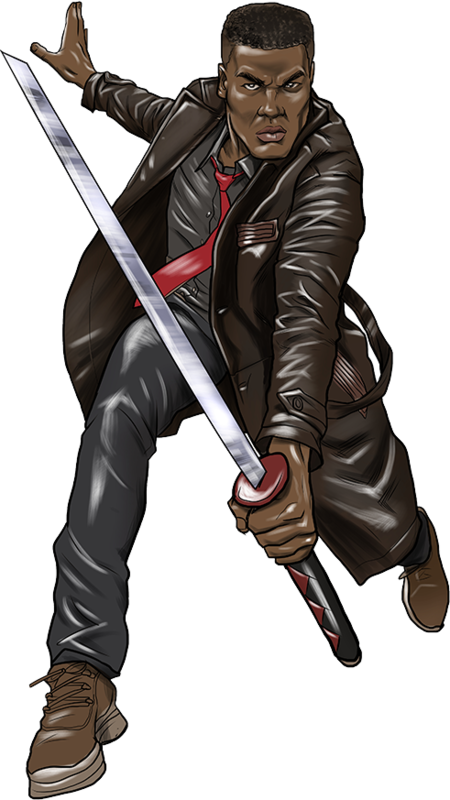 He is an expert swordsman and is trained in a number of fighting techniques. He has also cultivated a heightened spiritual sensitiviy that allows him detect the presence of ghost orphans. Peter Philadelphia was born from one of seven bloodlines of assassins and hunters collectively known as the The Veil. The families were incepted around the turn of the 15th century with the purpose of tracking and capturing a para-species of lost souls called ghost orphans. These wraiths have been wandering the earth for centuries ever since an evil group of 8 men and women known as the Sapphire Cult used incredibly powerful weapons called ghost-blades to wage war against the Roman Empire. You can see the full history of the ghost orphans in the story of Virginia Ice, but the short version is that when the Sapphire Cult went on their rampage way back in the 4th century they killed lots of people, and the soul of anyone who was slain by a ghost-blade was cursed to roam the earth, unable to find passage into the afterlife. The Sapphire Cult was eventually defeated by the seven original members of The Veil. Each of the them hailed from one of seven cities in the Asia Minor region, all of which are referenced in the New Testament Book Revelation in a passage where the Apostle John offers series of criticisms and praises to the churches that resided in each town – Pergamum, Ephesus, Thyatira, Laodicea, Smyrna, Sardis and of course Philadelphia. The original members eventually passed away. However, over a thousand years later the bloodlines began again. They carried the names of their predecessors and they carried a mission just as important as the first Veil: to hunt down ghost orphans and provide them with a passage to a heavenly afterlife. During the 16th and 17th centuries the seven Veil bloodlines spread throughout the world hunting the wraiths to the far reaches of the globe. This task however became exponentially more difficult when the ghost orphans learned the process of phantom-fusion, which allowed them to hide inside the bodies of human beings. Furthermore, some time in the 18th century, a large number of ghost orphans mobilized into an army and launched a bloody campaign against the seven families. Two of them were wiped out, and the other five would have been as well if not for the birth and maturation of Disa Philadelphia, who would almost single-handedly turn the tide of the war and eventually earn the title of greatest hunter ever. She paced the Veil for the better part of three decades, before relinquishing the status to her son. And that’s where Peter Philadelphia comes in. As good as Disa was, Peter was even better. He and his sister, Valerie, were representative of the new-age Veil for which their mother had laid the groundwork. Now operating out of the secluded Deep Wing of Platinum City University, Peter developed new blade techniques and fighting styles to teach to his peers as well as the next generation of hunters; he integrated technology in the tracking of ghost orphans; and he even worked with expert spiritual mediums, such as noted PCU professor of para-human studies, Mictlan, and the supreme Iga Clan Master Danzo, to enhance his paranormal sensory skills. As the top hunter, it was natural that he’d become the target of the most dangerous ghost orphan, Kallisto, who had now taken the form of the assassin Virginia Ice. Virginia was responsible for most of the violence against hunters. In fact, it was her actions that lead to the utter decimation of two of the bloodlines. Disa had spent most of her life futilely trying to capture the vengeful vixen. Now it was Peter’s turn. He first battled Virginia when he was about 21 years old. His mother had finally tracked her down and the two of them were locked in combat. The war weary huntress however was no match for the ghost orphan who had only recently phantom-fused with the young healthy body Virginia Ice afforded her. Disa was on the verge of losing her life when Peter arrived. He engaged the orphan in battle and forced her to retreat. For the next few years Peter and Virginia continued to hunt each other and engaged in numerous battles. Their passion to kill each other drove them… however, it was another passion altogether that kept each of them from ever truly going through with the death knell. Though Peter could never bring himself to totally give in to his feelings for her, their battles grew increasingly more intense and more passionate. It was customary for Veil members to hunt in packs, but whenever Virginia Ice appeared on his radar, Peter would go alone. He’d meet her in a secluded area and they would cross blades while discussing the potential merits and definitive downfalls of possibly igniting the romantic relationship that hung in the air between them. On one such occasion, their intimate swordplay nearly lead to the spark that could have caused both a literal and figurative explosion, as Peter had lured Virginia to a steel mill filled with volatile chemicals. Peter had hoped the heat would negate the use of Virginia’s patented ice-cold glocks. He was right – but it forced the ghost orphan to resort to more close range tactics. The two of them ended up face to face, blades to each other’s necks. But before anything could happen, they were alerted to the presence of Disa Philadelphia who had grown suspicious of the pair. The two of them quickly staged a violent exchange in which Virginia was able to “barely escape” Peter’s blade. After the close call, Peter decided it would be best not to hunt Virginia himself anymore. Instead he tasked other Veil members with tracking her. Of course none of them were ever as successful as he was, and he often had to live with the guilt of the hunters that she slew. He distracted himself with his work at PCU as a trainer and he began hunting alongside his mother more regularly. Eventually he caught the eye of fellow Veil member Reagan Smyrna and after a six month courtship, the two of them were married. Reagan was an average hunter, and afforded herself decently enough in the battle field. But her true passion was history. She knew the lineage of the Veil and the story of the ghost orphans better than anyone else and she specialized in the connection between Veil mythology and christology. She was a tenured professor in Platinum City University’s religious studies department and whenever she wasn’t teaching regular students the discourse of the world’s major religions, she was instructing Veil students on the rise of the Seven Families. Peter and Reagan had a loving and passionate relationship, but Peter knew he would have to one day reconcile what had happened (and potentially could still happen) between he and Virginia. He’d been married for 5 year and had not seen the vengeful vixen since the time Disa interrupted them, when the appearance of a ghost orphan in a Platinum City University classroom set in motion a series of events that would bring their paths together once more. The ghost orphan in question was residing within the body of a student named Derek Loman. He walked into Disa’s lecture hall and prophesied that within 7 week’s time the Seven Families would fall once and for all. Later that day, thousands of ghost-orphaned possessed people arrived at PCU and began silently marching around the institution’s Central Administration Complex – Derek Loman had said that the orphans would march around the college silently for the next 7 weeks, and then all hell would break lose. A half dozen of the most influential Veil hunters met to discuss the proper course of action. Some suggested that they simply take their living-blades and capture as many of the ghost orphans as possible. Peter however, reminded them that the vast majority of people had no idea what a ghost orphan was and thus it would simply look like a bunch of people with swords killing what, to the naked eye, looked like a throng of unarmed protestors. They attempted to question Derek, who was being held captive, but he was uncooperative at first. It was Peter’s sister Valerie who finally got him to talk. And when he did, Peter learned that Virginia Ice was indeed one of the driving forces behind what was happening. He made up his mind to find and confront her. But this time, his wife Reagan was determined to go and back him up. Disa also joined the pack and the three of them were able to track Virginia down. It was the same steel mill from the last time the star-crossed pair had seen each other – and it was hotter than ever before. Peter, Reagan and Disa confronted Virginia, but she was not alone. The Veil hunters were attacked by nearly two dozen heavily-armed ghost orphans. The henchmen targeted Peter, who needed every bit of skill at his disposal to dispatch the assailants. Disa assisted her son. Virginia Ice meanwhile targeted Reagan. The hunter acquitted herself well, but was no match for the experienced orphan. Virginia finally injured and disarmed Peter’s wife. But instead of killing her, Virginia revealed to her the complicated history between herself and Peter. Reagan barely had time to process what she’d just heard when the other two hunters swooped in and went after the ghost orphan with their living-blades. Before long, Virginia was overwhelmed and surrounded. Finally the House of Philadelphia was on the verge of capturing the most dangerous of all ghost orphans. Disa prepared to lay the death knell, but Peter wanted to question her about Derek Loman’s prophesy. Neither course of action, however would happen, as another group of warriors showed up to intervene on Virginia’s behalf. But these warriors were not ghost orphans – they were the villainous hell-spawned reapers, lead by the queen of reapers herself, Alva Devine. Normally reapers acted as the agents of hades tasked with using their ghost-blades to capture ghost orphans and send them to a torturous afterlife in the Lake of Fire. However on this occasion, Alva and her cohorts were standing side by side with the ghost orphans. Virginia and Peter locked eyes for the most intense 3 seconds of either of their lives, and then the reapers attacked! Peter, Disa and Reagan fought back and after several minutes of intense conflict, the Veil hunters were barely able to escape with their lives. That battle was over, but the newly discovered alliance between the reapers and the orphans signified that the war was about to be taken to a new level. Furthermore, the words Virginia Ice had uttered to Reagan Smyrna meant there was a whole new war about to begin. Peter Philadelphia’s life would never be the same.